"Vital new information for men diagnosed with prostate cancer!" If you or someone you know is one of the thousands of men diagnosed with prostate cancer each year, this book is must reading. In Prostate Cancer Breakthroughs, best-selling author Dr. Jay Cohen provides new information on PSA testing, targeted biopsy, and groundbreaking prostate cancer treatments. Concise and easy to understand, Prostate Cancer Breakthroughs focuses on the information that all patients need to know. It first offers a step-by-step look at the entire diagnostic process, up to and including the diagnosis, and suggests how you should go about getting a second and even a third opinion. It then describes twelve different treatment choices that may be considered. Other important topics include genetic testing, Carbon-11 Acetate PET/CT scans for earlier identification of metastases, medication therapy, and more. Studies have proven that most men diagnosed with prostate cancer do not need surgery or radiation treatment. Prostate Cancer Breakthroughs tells you how to determine what your options are. In the words of one reviewer, "This book answers all of your questions and others you didn't know to ask." * Why 85% of men who get surgery or radiation for prostate cancer do not need it. * Why a high PSA test does not necessarily mean cancer. * How to tell if you really need a biopsy (many men don't). * Why a targeted biopsy is superior to a standard biopsy, and where to get one. * Why dynamic contrast-enhanced imaging (DCE-MRI) is key to deciding on treatment. * Which genetic tests are available for accurate diagnosis and more effective therapy. * If medication, rather than surgery/radiation, is a valid choice for you. Today, many doctors and patients are still not aware of the breakthrough methods of diagnosis and treatment that are being used at top United States cancer centers. 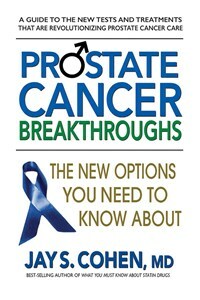 Prostate Cancer Breakthroughs provides the up-to-date information you need to make the choices that are right for you. Jay S. Cohen, MD, is an Associate Professor (Voluntary) of Family and Preventive Medicine at the University of California, San Diego. Dr. Cohen is a widely recognized expert on prescription drugs and their natural alternatives. He has published scientific papers in leading medical journals and has written articles for Newsweek, Bottom Line Health, and Life Extension Magazine. A highly sought-after speaker, Dr. Cohen is also the founder of the Center for the Prevention of Medication Side Effects, which offers commentary on current issues in medical care.